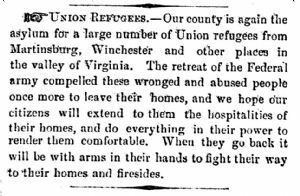 Our county is again the asylum for a large number of Union refugees from Martinsburg, Winchester and other places in the valley of Virginia. The retreat of the Federal army compelled these wronged and abused people once more to leave their homes, and we hope our citizens will extend to them the hospitalities of their homes, and do everything in their power to render them comfortable. When they go back it will be with arms in their hands to fight their way to their homes and firesides.